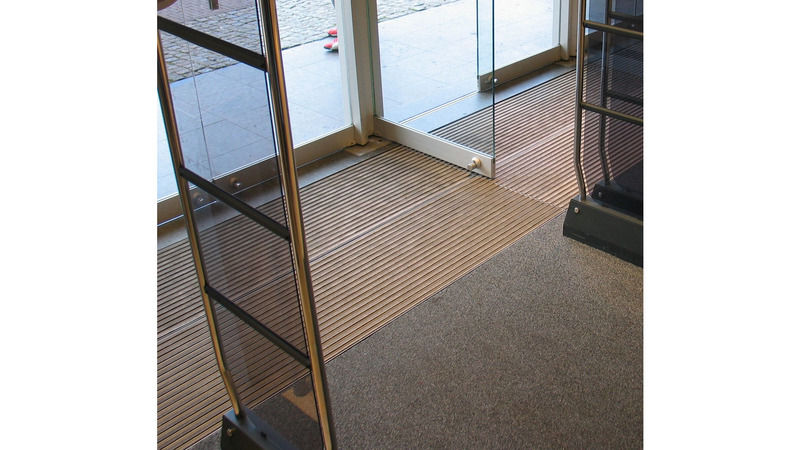 Our ABI Duplo mat is superbly suitable when your entrance is exposed to substantial wear and tear due to extreme use. Think of shopping centres, airports and metro stations, for instance. As manufacturer of this mat we will usually recommend our Duplo mat Standard in these projects, also very suitable for wheel chairs, shop trolleys or other transport trolleys. The ABI Duplo mat Standard consists of rubber profiles with plastic fabric integrated through vulcanisation. These profiles ensure a proper cleaning action and absorb an extreme quantity of water. As after the vulcanisation process we brush off the rubber on either side of the profile, this mat can be used on both sides. These rubber profiles are connected by means of aluminium spacer profiles, our H-profiles.